Wow! 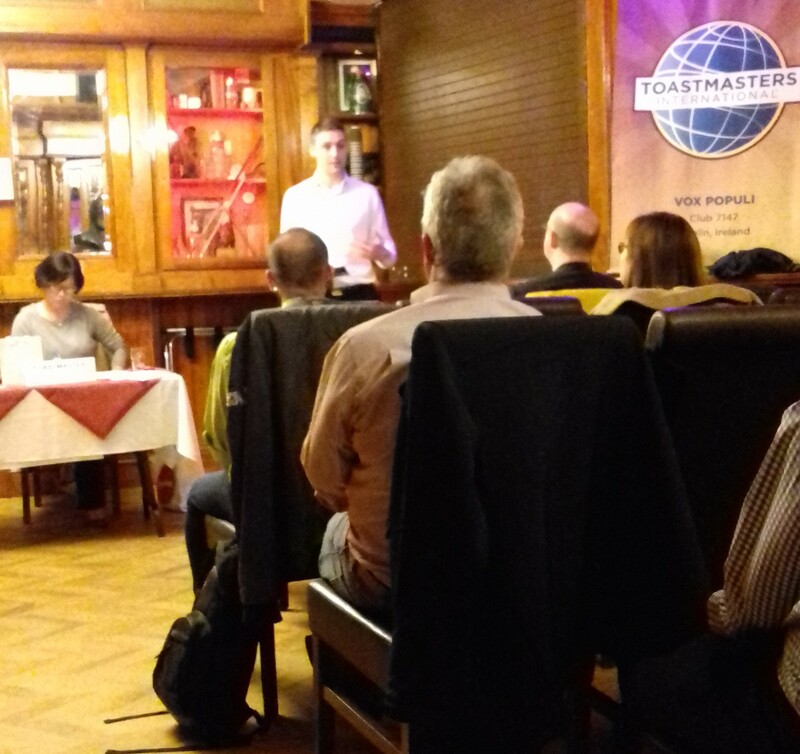 Our fourth Vox Populi Toastmasters meeting of the season was an exciting one last Wednesday night 17th October at the Harcourt Hotel. Bo, our very capable and confident Toastmaster for the evening, chaired a meeting that had a distinctly ‘Royal’ air! The meeting kicked off with a rapid fire topics session from our trusty Topics Master, Brian, who tested our ability to think on our feet and challenged us with a range of stimulating and occasionally, philosophical, topics. The main focus of the meeting on Wednesday night was to give our two amazing contestants, Gerry and Dan, in the Humorous speech contest next week, the opportunity to do a ‘dry run’ of their speeches. Brian took the opportunity to take them completely out of their comfort zone and get them to do a role play of Megan Markle announcing her pregnancy to Prince Harry. Any prizes for guessing who played Megan and who played Harry? Well, Dan did a very convincing impersonation of Megan – at first playing a little coy with Harry (Gerry) and not coming straight out with his (her?) big news. When Megan (Dan) did eventually make her announcement to Harry (Gerry), Harry didn’t take the news too well…………… perhaps dumbstruck by the prospect of an end to his carefree days and no doubt anticipating the imminent purchase of prams, nappies and gold plated rattles! Karoline wrestled with a dilemma that descends upon many of us – which band to choose between – U2, Oasis or Blur, finally settling on U2 on the basis that they have tried more exciting things with their marketing and PR. Well said Karoline! Kieran was also faced with a dilemma of another kind – what would he do if he won a euro on a lottery ticket? Now you can’t buy very much with a euro these days, but Kieran decided to take the scientific route and conduct a repeat of an experiment done previously and put the euro on the ground, hide in a bush and see if anyone would pick it up. What other interesting human behaviour might Kieran observe from behind that bush, I wonder? Best not to speculate! Lisa gave us a wonderful philosophical topic on why you cannot make an omelette without breaking eggs, stating that some things have to break in order to get better and improve. Shay was equally philosophical on his topic of ‘no man is an island,’ speaking eloquently on why the important people in your life, friends and family, make all the difference. John also spoke eloquently on how he would bring the bird of peace, the dove, to the US in these current tumultuous times. Gerry and Conor both had some great advice for guests thinking of joining Toastmasters. Gerry recommended that you should try and get to speak at every single meeting as this builds confidence, regardless of whether you undertake a role or do topics or a speech. Conor had some equally valuable advice i.e. to be the second responder to a topic at every meeting and to set goals for yourself at Toastmasters each year. Richard had us all pealing with laughter with his jokes in the Open Mic session, but the laughs didn’t end there. Gerry entertained us all with his speech about a ‘Bride from Hell’ and her ill-fated wedding day. While Dan showed us all his irrepressible wit with his speech on ‘Internet Nonsense,’ taking us on a whirlwind tour of pop up ads, Instagram, listicles and more. His words ‘Don’t be like Grace Jones, don’t be a slave to the algorithm’ will haunt me forever! Deirdre and Albert both gave excellent and encouraging evaluations of Gerry and Dan respectively, with constructive advice for both contestants in the Humorous Speech contest which will hopefully see them in good stead on Wednesday night. Best of luck Gerry and Dan! All in all, it was another great meeting with plenty of laughs, ideas and heart-warming insights from the club members. Roll on the next Club Meeting, Wednesday 7 November 7pm at the Harcourt Hotel!